Wisconsin Gov. 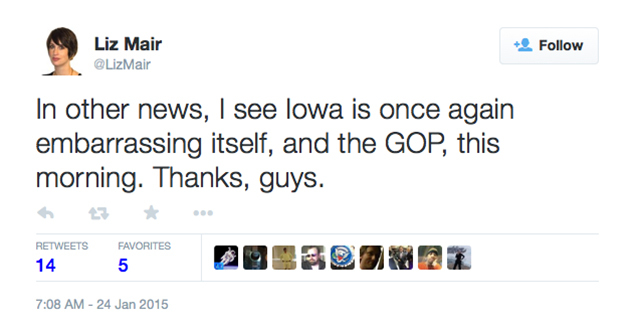 Scott Walker has a funny way of trying to entice Iowa Caucus voters to consider supporting his presidential candidacy. His latest hire will likely throw those on the fence about his candidacy back to the side of undecided. 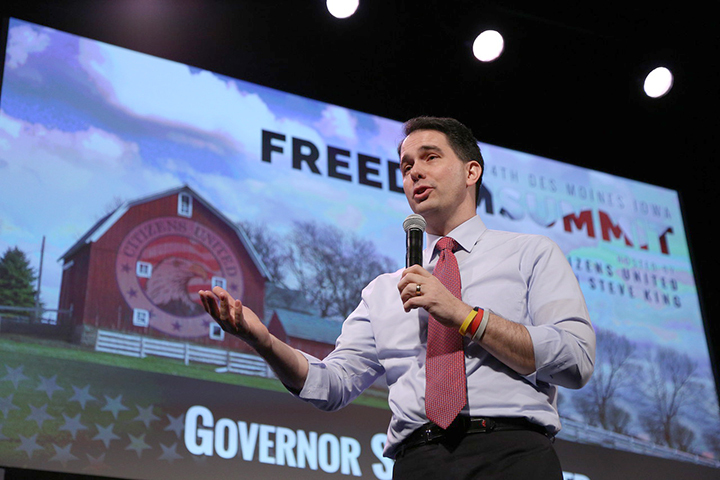 According to CNN Monday morning, the Walker campaign announced it had hired veteran strategist Liz Mair to oversee online outreach. Mair’s political consulting firm, Mair Strategies, will provide input on digital strategy and messaging while advising on social media and blogger outreach for Walker’s PAC, Our American Revival. Mair gained experience in those areas after helping Walker in previous positions, including during his 2012 recall election. She also logged time with the Republican National Committee in 2008 and has also worked for Carly Fiorina, former Texas Gov. Rick Perry and U.S. Sen. Rand Paul. Some of her online activity is already gaining the attention of Iowans, but it’s not good attention. Ethanol has not been subsidized for several years, although the Renewable Fuels Standard does establish benchmarks for how much of it must be sold in the U.S.
Iowa activists have criticized the comments in social media. Most are shocked that a campaign that is trying so hard to earn their vote would hire someone who insults them directly and is diametrically opposed to their worldview. 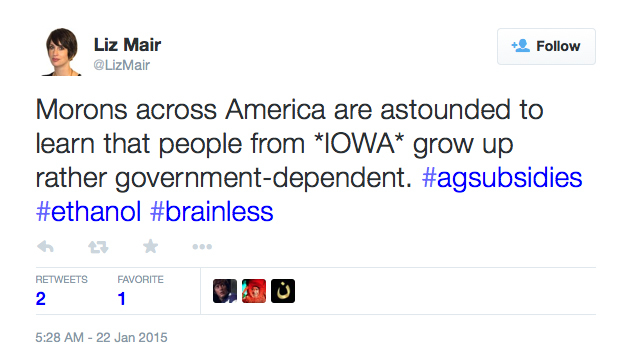 The Our American Revival PAC was asked by The Iowa Statesman to respond to these comments. The PAC has not responded. The Iowa Statesman will update this article as developments warrant.